Let's face it, with the gorgeous full screen design, liquid resolution display, sharp color and robust battery life, iPad is making itself an incredibly solid device to play movies, television shows and other videos in high quality. Besides, the obvious portability which relieves users from toting around a heavy laptop is also regarded as a big plus. When it comes to watching movies on iPad, a heap of resources are available, from YouTube, Netflix, to Crackle, where you can stream movies on iPad. But what if you are going on a trip or in somewhere no internet is accessible? Therefore to save movies to iPad for offline playback seems to be a good solution. How to download free movies directly to iPad? Here we introduce two simple methods to download movies, TV shows and videos to iPad. It's actually quite easy to download movies, TV shows and videos to iPad with the help of a proper tool. 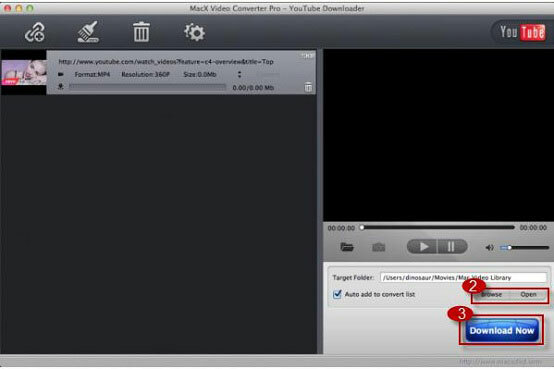 To do this task, MacX Video Converter Pro is an ideal choice. This program has a knack for downloading movies from YouTube and 300+ other videos sites, and is capable of recording undownloadable full movie from Netflix, Amazon and others, no matter they are SD, HD or UHD movies. Besides, it has a strong ability to convert the downloaded movie to iPad supported formats like MP4, MOV, M4V as well as many other popular video formats, including AVI, WMV, MKV, TS and many more. Thanks to the 400+ preset profiles, you are allowed to directly convert the downloaded movie to a file perfectly for your iPad /Air/Pro/Mini, as well as iPhone, Android Samsung, HTC, Google Nexus, Surface Pro, Huawei, etc. Download this iPad movie downloader for Mac and run it. Hit "YouTube" button and click "analyze" to load the movie details by copying and pasting the wanted video URL from YouTube. Or clicking "paste & analyze" button to automatically detect the YouTube videos on the opening website page. Choose one of the format supported by iPad like MP4, or you can just select the device directly from the device profile is you are new to any formats stuff as the output format. You can also adjust the audio and video parameters. Click "RUN" and the iPad movie downloader will automatically start downloading movies to iPad mini (4). You can freely download any movies and videos to your iPad following the above guide, including iPad 2, new iPad 3, latest iPad Air 2/Mini 4/iPad Pro as well as various other mobile devices. Also iTunes offers extensive movies for playback on iPads, ranging from newly released blockbusters to classic films. Although the movies on iTunes comes for certain charges, you are allowed to either watch movies on iPad by streaming from the cloud or download movies to your iPads once purchased or rented, for further loading up your iPad before going somewhere no internet is accessible. Follow the following guide on how to download movies on iPad from iTunes. After install iTunes on your computer, launch it and connect iPad to computer. The iPad interface will automatically pop up, or just click the application window to enter. Browse through the movies and find the movie you want to watch on iPad. Choose the quality and select the buttons below the film. Then click the Buy or Rent button to purchase your selection before you are allowed to download movies from iTunes to iPads. Click the Movies tab in the middle of the top navigation bar and check the box directly left of Sync Movies. Check the box next to the movies you wish to include or use the drop-down menu at the top of the tab to automatically sync a limited selection of recent and unwatched movies. Click the Apply button in the bottom-right corner when you're satisfied with your selection. Tips: In addition to download films to iPad, many users may also want to download torrents on iPad when they want to share large file with others. But how to download movie torrents on iPad without Jailbreak? Take it easy, a simple guide can easily help you out. First, open Safari browser and find the torrent on the torrent site. Second, long press the download button and three options will appear: Open, Copy, Cancel. Then select Copy and open www.zbigz.com. Now paste the copied torrent link to the URL box and Zbigz will now create the download link in minutes. Click the link to download torrents on iPad. Having trouble playing YouTube 4k videos online? You can follow the guide to download 4K UHD video from YouTube and enjoy the content offline without network connection. This is a step-by-step guide on how to easily download YouTube videos and watch on your Macbook Air with fast speed. This tutorial shows the detail information about how to convert video to iPad supported video audio formats on macOS with iPad video converter.